Making a good-looking racing game for the iPhone isn't that difficult, but winding tracks and multiple laps don't sit well with players looking for a quick fix. You know what does work well? Drag racing. In a console game, drag racing is generally pretty boring. When you've got stunning 3D environments and all of that screen real estate to play with, why go in a straight line? When you can offer marathon multi-lap affairs in full 1080p, why bother with 10 seconds of acceleration? On the iPhone and iPad, however, sometimes all you have is 10 seconds, and in those 10 seconds, NaturalMotion's CSR Racing shines. It's all about two cars racing to the finish line as quickly as possible, shifting at just the right moment to out-accelerate the competition. There's no steering. There's no driving around in a circle. It's a pure and simple bite-sized racing experience. Just because it's quick doesn't mean it's shallow. 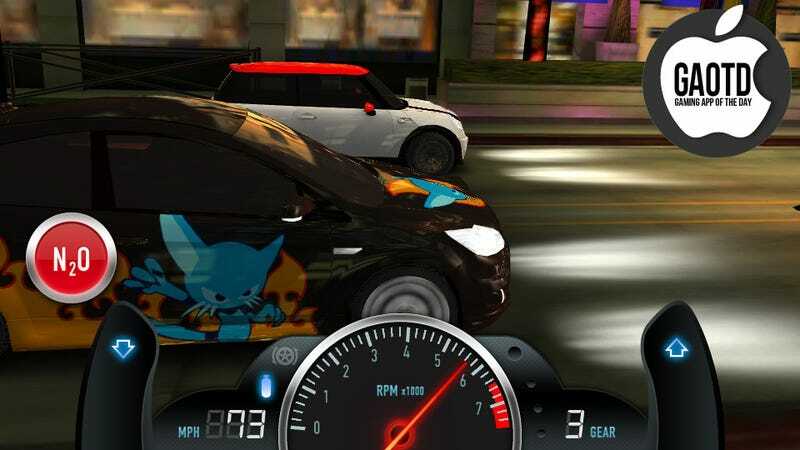 CSR Racing features a story mode that challenges the player to defeat a series of street gangs, climbing through their ranks until they take out the boss, unlocking the next neighborhood to conquer with oil and nitrous. To win you'll have to tune your vehicle, using cash earned from exhibitions and daily challenges to purchase better tires, more powerful engines, and other upgrades that aid in balancing power with potential wheel spin. Crafting your ultimate ride out of base models from Audi, BMW, Chevrolet, Ford, GM, Mini and Nissan is a balancing act; thankfully CSR Racing holds your hand throughout the process, helping ensure your engine block doesn't drop out mid-race. The game is free, which is also a plus, but freedom comes at a cost. You've only got a set amount of fuel points to race with; once you run out you'll have to wait or pay for more. It's almost a Facebook game in iPhone clothing in the regard. You can earn gold to purchase rare new cars, or you can buy it. I've not spent a single cent on CSR Racing, and so far I'm still having fun. My car has a fancy sticker on the side and parts more valuable than the initial vehicle investment. Sure, I've only got the one ride, but I've come to depend on it. It's my pal. CSR Racing's races only last seconds, but that's okay. It just means I can race more, and that's no drag.